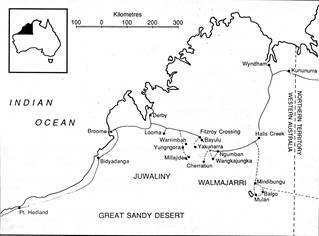 The Walmajarri language (Ethnologue/ISO code: wmt) is spoken by the Walmajarri people who traditionally lived in the Great Sandy Desert to the south of the Kimberley. Subsequent events took them to cattle stations, towns and missions scattered over a wide area in the north of Western Australia. Currently Walmajarri people live in towns and communities from Mulan (Lake Gregory) in the east along the Fitzroy River valley and as far west as Bidjadanga on the coast. This Walmajarri Interactive Dictionary is based on the Walmajarri-English dictionary compiled from materials Eirlys Richards and Joyce Hudson gathered in and around Fitzroy Crossing between 1967 and 1984 while working as field linguists. Walmajarri speakers: Limerick Malyapuka, John Charles, Pompey Siddon, David Downs, Tommy May, Peter Skipper, Mona Chuguna, Jimmy Pike, Olive Bieundurry (Knight), Rena Pindan, Mary Nellie, Budgie Honeychild (Yankarr), Lucy Walgarie, Bessie Doonday Napangarti, Freda Napanangka, Nancy Bangu, Nundi Bemba and May Stundi. Illustrators: Alan Lawford, Frank Gardener and Chris Hill. The Walmajarri speakers represented known dialects of the language. Where they identified words as belonging to a particular region or group, the identification used was shown in brackets after the headword; (E) Eastern, (J) Juwaliny, M (middle), (N) Noonkanbah. The electronic version maintains this identification. The dictionary was published by SIL as Richards and Hudson (1990), but is now out of print. In 2012 the 2nd edition was published using the same content as this electronic version. For this interactive version, minor revisions have been made to the electronic database by Richards and Hudson. · Semantic categories have been added to assist electronic searches. · Audio files have been added to many of the entries. The following Walmajarri speakers have provided these: Clarrie Maurie, Ludo Pindan, Annette Lormada, Susan Chiguna, Mona Chuguna, Irene Bent, Stella Jimbidie and Jennifer Dickens. · Photos have been added to a number of entries. They were contributed by Pat Lowe and Tanya Vernes. · Original entries for fauna and flora have been edited using information from the draft publication Walmajarri Plants and Animals: Aboriginal flora and fauna knowledge from the Paruku IPA, southern Kimberley. The interactive version of this dictionary and the introduction was prepared by Maarten Lecompte using Toolbox and Lexique Pro. Walmajarri consonants are presented below. The symbols used in the practical orthography in the Walmajarri Interactive Dictionary are presented first in dark red, with IPA symbols in square brackets for special sounds. All sounds in the stop series have voiced and voiceless allophones. A phonology and grammar sketch of Walmajarri can also be found here. Hudson, Joyce. (1978). The core of Walmatjari grammar. Canberra: Australian Institute for Aboriginal Studies. Hudson, Joyce and Eirlys Richards. (1969) The phonology of Walmajarri. Oceanic Linguistics 8/2: 171-189. Hudson, Joyce. (1981). Some features of high level phonology in Walmatjari. In Bruce Waters (ed. ), Australian phonologies: Collected papers, 245-57. Work Papers of SIL-AAB, A-5. Darwin: Summer Institute of Linguistics. Hudson, Joyce and Eirlys Richards. (1976). The Walmatjari: An introduction to the language and culture. Work Papers of SIL-AAB, B-1. Darwin: Summer Institute of Linguistics. Richards, Eirlys. (1979). The Walmatjari noun phrase. In Christine Kilham (ed. ), Four grammatical sketches: From phrase to paragraph, 93-128. Work Papers of SIL-AAB, A-3. Darwin: Summer Institute of Linguistics. Richards, Eirlys and Joyce Hudson (comp.) (1990). Walmajarri-English dictionary. Darwin: Summer Institute of Linguistics. Richards, Eirlys and Joyce Hudson (comp.) (2012). Walmajarri-English Dictionary: with English Finder List. 2nd edition. AuSIL Dictionary Series, A-5. Darwin: Australian Society for Indigenous Languages.